Concrete work to include 12" wide x 8" deep continuous footings on perimeter of house and 3 poured pads to support house under carrier beam. House walls will be 8" thick poured 7' 10 high on footings, walls will be reinforced with steel rebar and anchor bolts will be installed in top of wall to secure house to foundation. Garage walls will have same footings but be poured 4' 10' high and be pinned to house walls. Concrete slabs will be poured in house basement and garage, basement floor will be 4-5" thick power troweled finish; garage will be 5-6" thick power troweled. All lumber will be kiln dried except where pressure treated is used on sills and porch deck framing. Foam sill seal will be installed on concrete walls, 2 x 6 PT sill plate will be bolted to concrete walls. Three 2 x 10" kiln dried boards for the carrier beam will be installed between beam pockets on opposing walls of basement. This will be supported by approx. three 4" diameter cement filled steel columns with steel plated top and bottom, pending engineering plan. Engineered floor joists on entire 1st and 2nd floor on 16" centers, band header will be 2 x 10". Floor sheathing will be 3/4" Advantec plywood. Exterior walls will be framed with 2x6 lumber, studs 16" on center, single bottom plate double top plate; exterior sheathing will be 7/16 OSB plywood. Interior walls will be 2 x 4 constructions with 16" centers, single bottom plate double top plate. To be R- l9 Kraft Batts on 6" exterior walls, vapor barrier, and R-38" ceilings. Strapping will be installed on ceilings inside house, 16" centers to support drywall on ceiling. Garage is not insulated. Will be constructed with 2x10 and 2x12 roof system stick framed 16" on center with bracing installed; roof sheathing will be 5/8" tongue and groove plywood. Gable end trusses will be studded and sheathed with 7/16" OSB sheathing. Gable ends and eaves will have 12" overhangs. A continuous 2x8 band will be placed on rafters' tails and hung in gables to support 4" wide stepped fascia which will be wrapped in aluminum (choice of colors). Soffits will be white perforated vertical vinyl on eaves and solid in gables. Rafter mate eave venting will be installed between trusses under roof sheathing to ventilate roof. Continuous ridge venting will be installed at ridge to ventilate roof. Typar house wrap will be installed on walls on the exterior of house. Drywall installation will be 1/2” throughout interior of house; Walls & ceilings to receive tape coat plus two additional coats of joint compound, sanded and primed prior to finish painting. Garage wall adjacent to house will have Fire Resistant 5/8" thick drywall on wall and inside gable to peak of roof; this will have exterior tape coat. Garage walls will not be sheetrocked. Interior painting will consist of 3 latex coats on walls and ceilings with Sherman Williams Brand Paint, 1 Primer Coat with 2 coats of Finish throughout the house. Ceiling will be painted white. 1 color for walls and 1 color for trim, additional colors are $100 per color change. All interior trim will be "colonial" design; windows, doors and interior doors will be picture framed with 2.5" wide colonial casing. Baseboard will be 3.5" wide colonial base molding. A simple handrail will be installed in stairwell, round with brass brackets. A similar railing will be installed in stairwell to basement. All interior doors will be removed from hinges and with durable interior semi-gloss paint (all doors same color). All interior trim, window sashes, frames/jambs and interior door frames/jambs will be brushed and rolled. All stained surfaces will receive 3 coats of water based satin polyurethane. All windows will be Alliance or equivalent double hung with tilt clean sashes sized according to schedule on plan and located as per plan; these windows will be white exterior aluminum trimmed with interior wood sashes and jambs. Wood on sashes and jambs will be painted. Pre-jayed and low e-argon gas. All doors sizes as per plan located as per plan. Exterior doors will be steel, Garage entry door will be 9 light door as will entry on breeze way if applicable. Door between house and garage will be a steel 6 panel fire-rated door as per code. Two 9 x7 white finish insulated overhead doors without glass, with remote openers. Colors, Window, and sizes are available at additional expense. 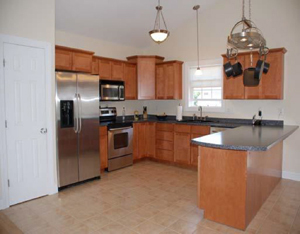 A kitchen design is provided that shows kitchen layout for this house plan; there is a $5,000 allowance. $7500 flooring allowance to work with; example flooring to be Tile, Hardwood and Carpet. All electrical work will be installed by licensed Master electrician. This service begins at street to house and includes meter enclosure, circuit panel box, circuit breakers and all house wiring as per code. Kitchen will be wired with GFI breakers where required with separate 110 branch wiring for refrigerator, microwave, dishwasher and 220 for range. A 110 volt wire to furnace and controls with shutoff at top of basement stairs. A 220 volt receptacle will be provided for dryer and a 110 volt for washer. Exterior switched lighting circuits to all entries including lights in ceiling of garage. Two receptacles will be installed in ceiling of garage for electric garage door openers. A wall mounted exterior GFI receptacle will be installed on the front and rear of house as per code. One GFI receptacle will be installed in basement. The basement will have switched ceiling lights, these will be keyless white porcelain sockets like those used in garage. All bedrooms, dining room and living room will be wired from switch to fixture box to permit possible installation of ceiling fans and lights. All bedrooms to be protected with ARC breakers as required. All bathrooms to have GFI above sink. All bathrooms to have switched vanity lighting above sink. All bathrooms to have switched ceiling mounted recessed vent fan. Two upstairs bathrooms to have switched overhead light. Bath vent fans prior to electric work as this is included in electric fixture budget. Hard wired smoke/fire detectors will be installed, 1 on each floor and 1 in each bedroom as per code; these must be ganged so that if 1 alarm sounds they all sound. These will be provided by electrician. Recessed lighting will be installed in kitchen, this will be limited to no more then 8 K-5 six inch diameter white trimmed recessed units in ceiling with switch near sink. All plumbing will be installed by licensed Master plumber. All plumbing work will begin at entry of water supply pipe to basement and end at exit of waste pipe through foundation. All supply piping will be pex with copper manifolds and PER supply pipes with brass fittings and copper crimp sleeves, water supply shutoff will be installed in basement with shutoff valves located under each sink and at laundry area all waste pipes will be PVC, sized as required. A PVC vent pipe through roof in roof boot flange will be installed in shingled roof to prevent leaks. All Flushes, Faucets, Tub/shower units will be American Standard. Note: Customer has allowance and can use any fixtures! Those listed above are just examples. Exterior frost-proof hose bibs will be installed, 1 on the front and 1 on the rear. Heating work will include installation of oil fired hot water boiler,(HB Smith or equivelent). One 275 gal. oil tank will be installed with fill and vent to exterior of house through sill and mounting block in siding. Baseboard will have (x) amount of zones pending engineers plan with 1 zone serving the first floor and 1 serving the second floor, water will be delivered in 3/4" heat PER cross-link polyethylene tubing from boiler. Baseboard will be petit 7 in off white color; the size of heating units will be adjusted for each room so as to provide BTU's needed per room against heat loss plan. Porch roof to be wired for appropriate lighting design (to be created).